Situated in the leafy suburb of Balgowlah on Sydney’s Northern beaches, this 1930’s single storey bungalow was about to be brought into the 20th Century. 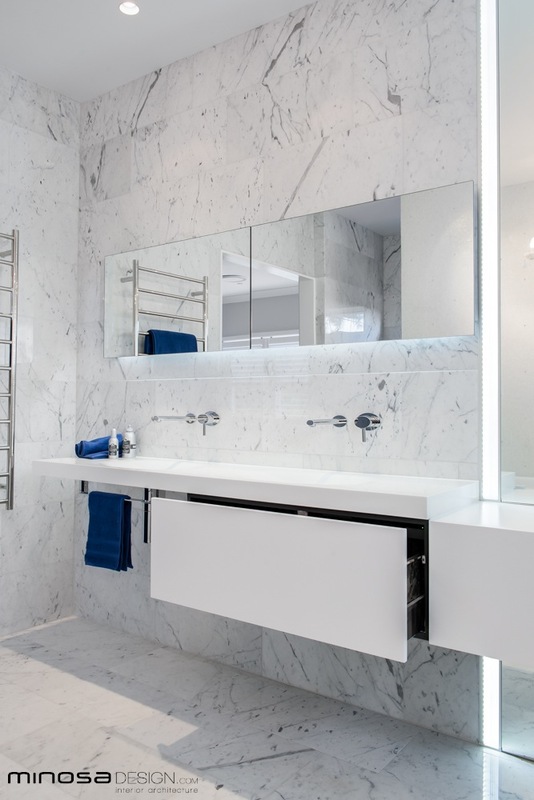 The new bathroom build was part of a much-anticipated second storey addition for our clients, whom had recently returned to Australia from a lengthy work placement in Singapore. It is going to be “home” for many many years to come. The family consisted of two adults with two young children. The kids are aged 5 and 9, and this space needed to be the parents’ personal oasis. A place for relaxation and rejuvenation - an escape from the daily grind! 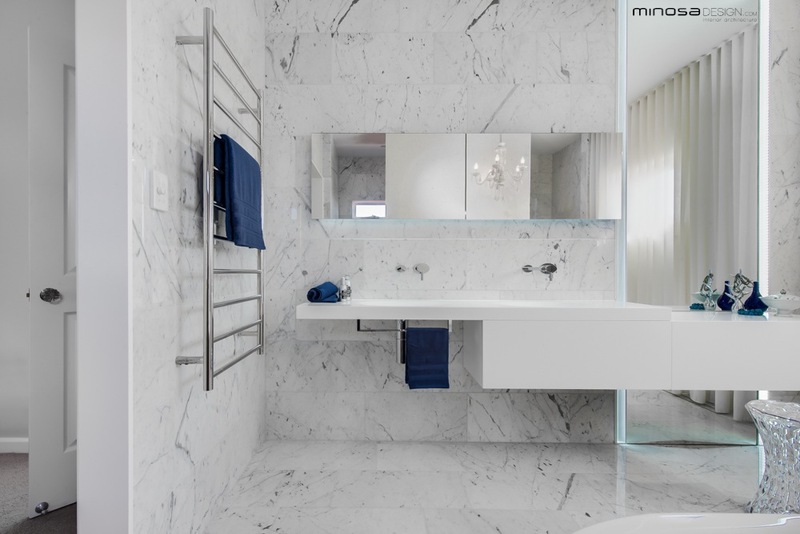 The new bathing space had to play a pivotal part of the parents’ private retreat, the space needed to exude sophistication and attention to detail. High glamour was the words! It needed to be spacious and reflect the amazing light of the northerly aspect it captured and most importantly it had to sit in an open plan situation. · Had to be glamorous & private. 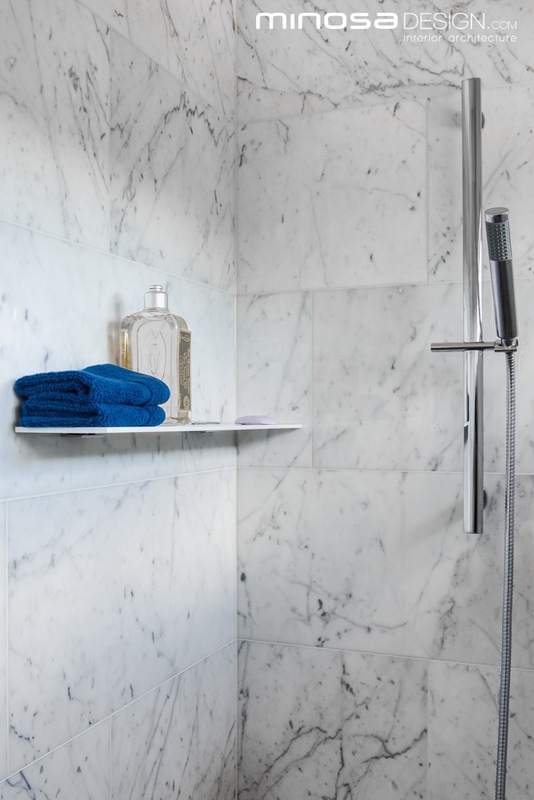 · Spacious, light with good flow – functional! · Two-person use at any time. · Hi Glam! Space HAD to have a chandelier – Bling! · Achieving the brief in itself! 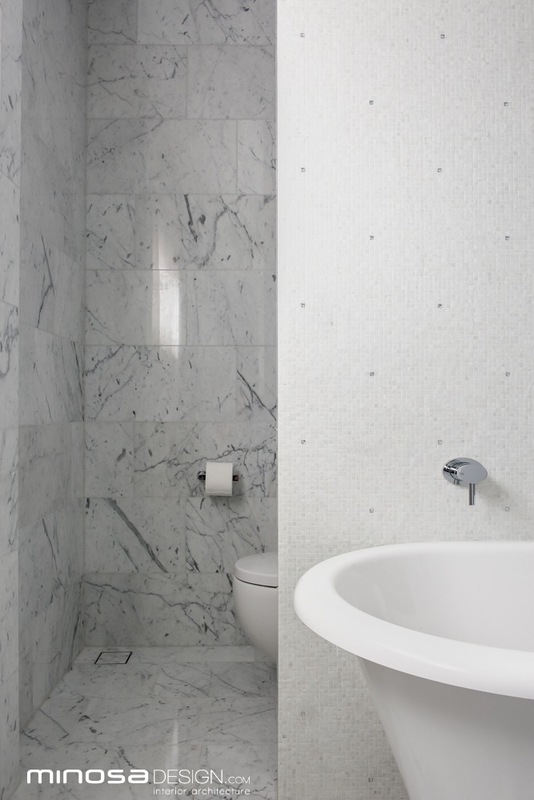 With such an extensive brief, the amount of product required and given the open plan request the designer chose to break from the normal 4-wall approach for this bathroom design. In spatially planning the space, a central wall was positioned within the room. 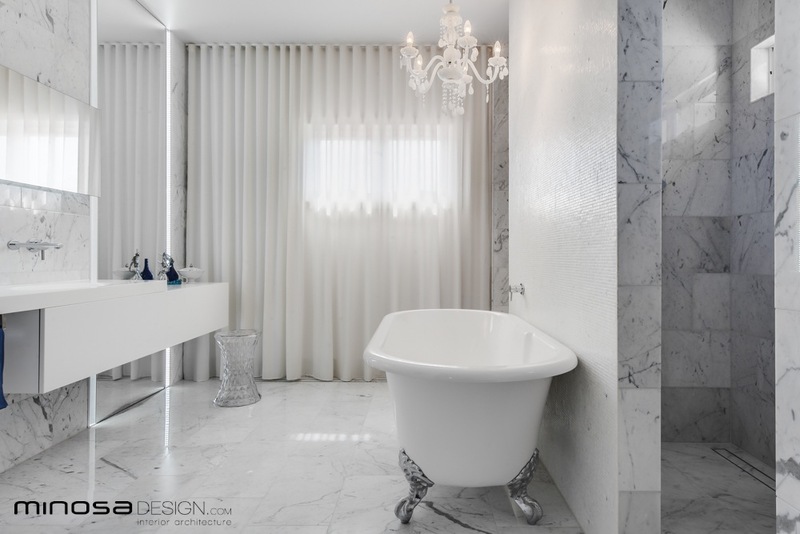 This allowed for perfect placement of the beautiful freestanding claw footed bath and also the crystal chandelier. 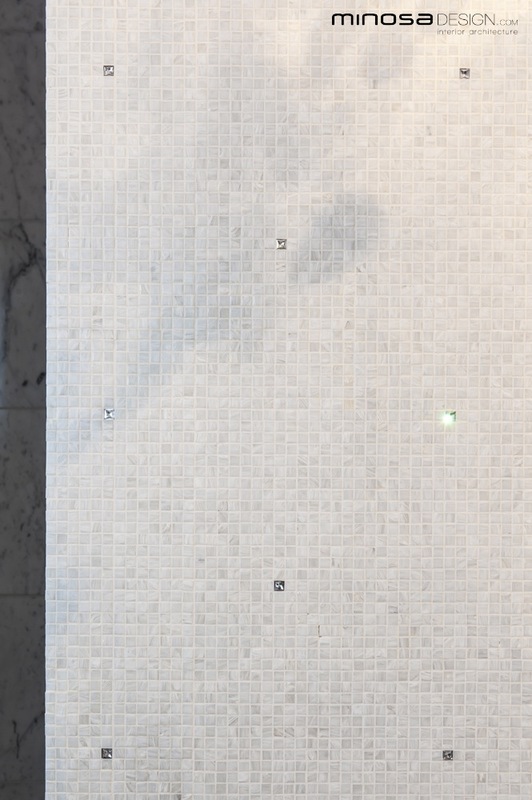 For an added assault to the “bling” factor a Bisazza Swarovski crystal/glass white mosaic was used as the feature wall tile. This was also the first thing one views from the bedroom upon entering. 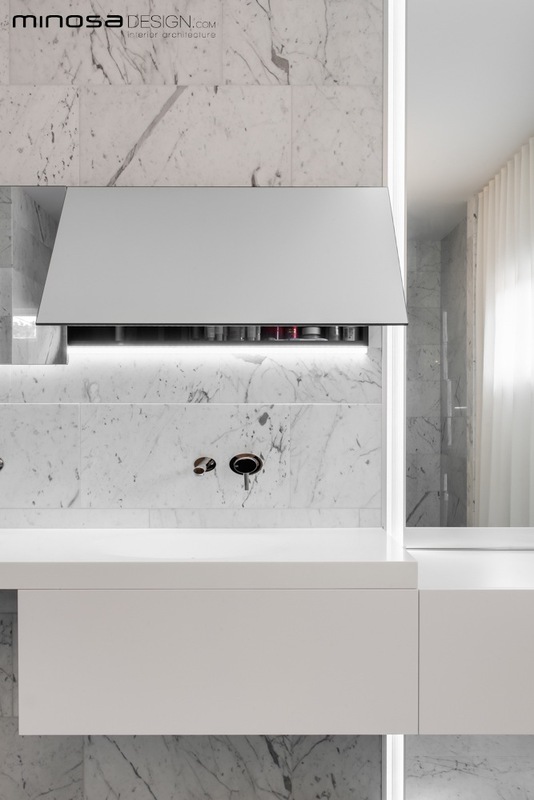 Opposite, a double Corian® washbasin was selected with overhead and under bench storage. These items met the brief of lots of storage. The overhead recessed mirror cabinet has oversized mirror doors; incredibly they lift up to 90deg and will stay held in position wherever the client chooses… great for close makeup inspections! 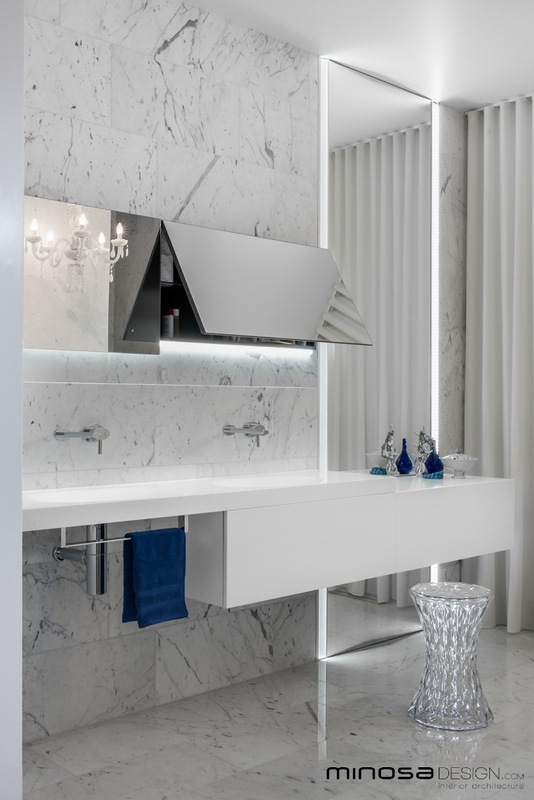 The base units are offset, it provides a set down vanity area for the female client to prepare for her day, as well as to give an asymmetric appearance to the space; these units are electronically driven for ease of use. 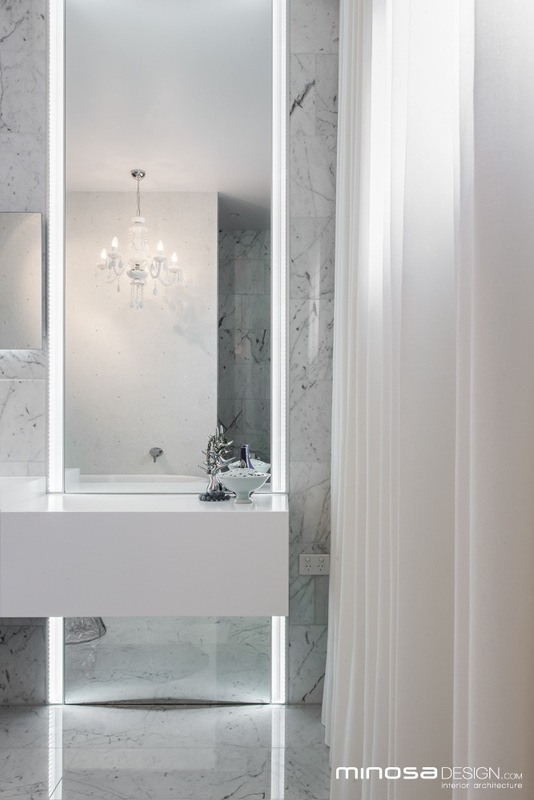 The need for a dressing area was a real challenge, the designer chose to integrate LED lighting vertically in an aluminium extrusion that throws light across itself so that at 300mm from the front face of the mirror the light would intersect thus given perfect facial illumination. She loves it! Along with the feature chandelier, LED lighting takes on a large part of this design and is all controlled via dimmer for mood setting for when the space is used to relax and unwind. 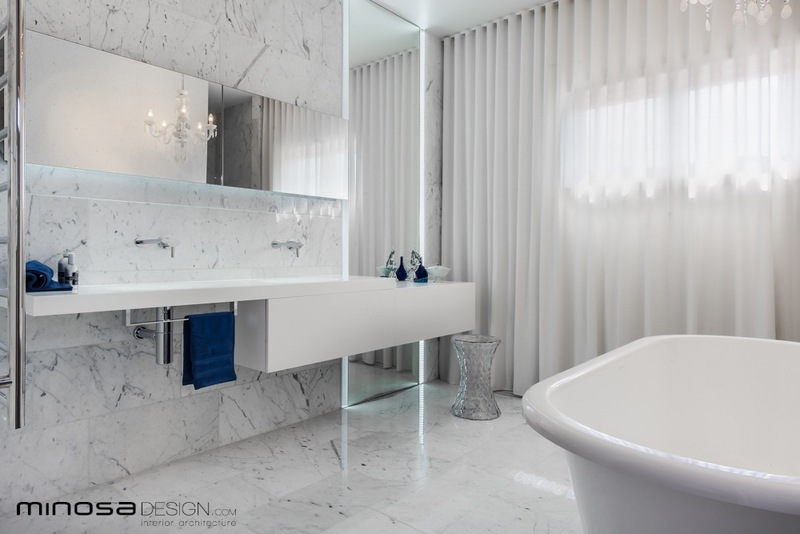 The success of this space is the drama created with the brilliant materials selection. 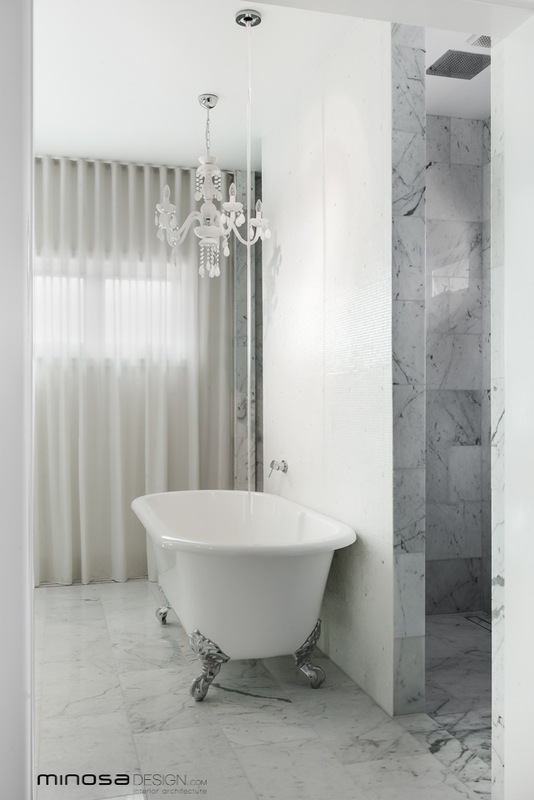 Stone tiles are used to create a sense of luxury, a free flowing long sheer custom curtain adds to the impact whilst also softening the space. Fittings are beautiful, functional and mostly Italian as the quality is there. 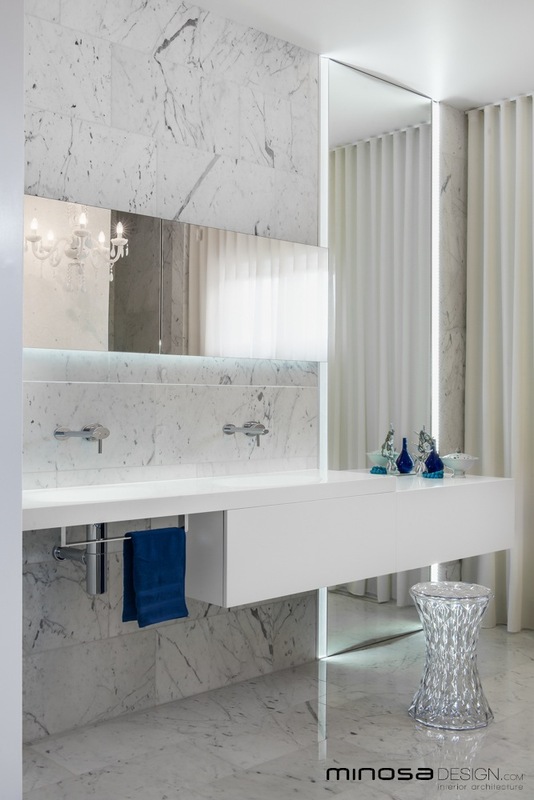 The furniture and washbasin are Australian made, a perfect compliment to the space in every way. The only requirement not met was their budget. The design surpassed their forecasted spend. However once the clients understood why they had to spend alittle more, they had no doubt that the result would ensue. 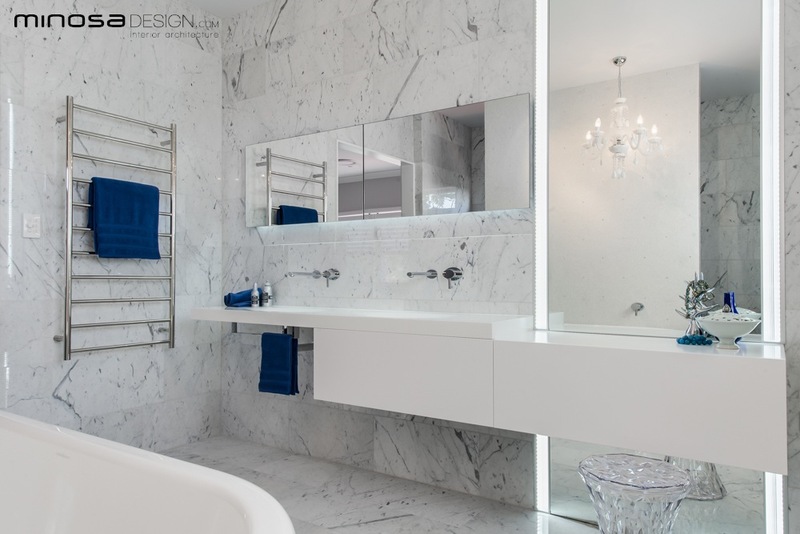 The end result oozes luxury and in the clients own words we “created a masterpiece”!